The AGM-154A Joint Standoff Weapon or JSOW is currently under development by Raytheon [Texas Instruments] for the Air Force and the Navy. 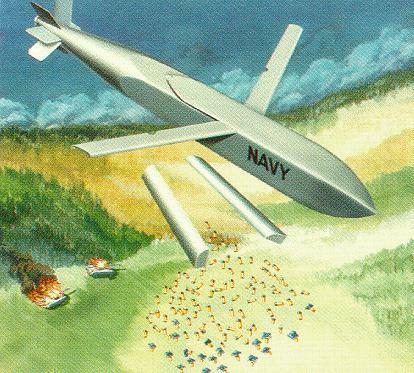 The AGM-154A (Formerly Advanced Interdiction Weapon System) is intended to provide a low cost, highly lethal glide weapon with a standoff capability. 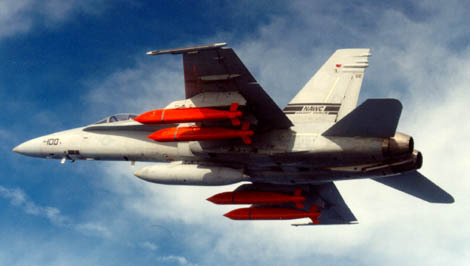 JSOW family of kinematically efficient, air-to-surface glide weapons, in the 1,000-lb class, provides standoff capabilities from 15 nautical miles (low altitude launch) to 40 nautical miles (high altitude launch). The JSOW will be used against a variety of land and sea targets and will operate from ranges outside enemy point defenses. The JSOW is a launch and leave weapon that employs a tightly coupled Global Positioning System (GPS)/Inertial Navigation System (INS), and is capable of day/night and adverse weather operations. The JSOW uses inertial and global positioning system for midcourse navigation and imaging infra-red and datalink for terminal homing. The JSOW is just over 13 feet in length and weighs between 1000-1500 pounds. Extra flexibility has been engineered into the AGM-154A by its modular design, which allows several different submunitions, unitary warheads, or non-lethal payloads to be carried. The JSOW will be delivered in three variants, each of which uses a common air vehicle, or truck, while substituting various payloads. AGM-154A (Baseline JSOW) The warhead of the AGM-154A consists of 145 BLU-97/B submunitions. Each bomblet is designed for multi-target in one payload. The bomblets have a shaped charge for armor defeat capability, a fragmenting case for material destruction, and a zirconium ring for incendiary effects. AGM-154B (Anti-Armor) The warhead for the AGM-154B is the BLU-108/B from the Air Force's Sensor Fuzed Weapon (SFW) program. The JSOW will carry six BLU-108/B submunitions. 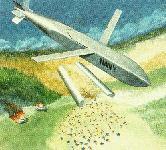 Each submunition releases four projectiles (total of 24 per weapons) that use infrared sensors to detect targets. Upon detection, the projectile detonates, creating an explosively formed, shaped charge capable of penetrating reinforced armor targets. AGM-154C (Unitary Variant) The AGM-154C will use a combination of an Imaging Infrared (IIR) terminal seeker and a two-way data link to achieve point target accuracy through aimpoint refinement and man-in-the-loop guidance. The AGM-154C will carry the BLU-111/B variant of the MK-82, 500- pound general purpose bomb, equipped with the FMU-152 Joint Programmable Fuze (JPF) and is designed to attack point targets. Texas Instruments (TI) Defense Systems & Electronics (DS&E) began Engineering and Manufacturing Development (E&MD) of JSOW in 1992. 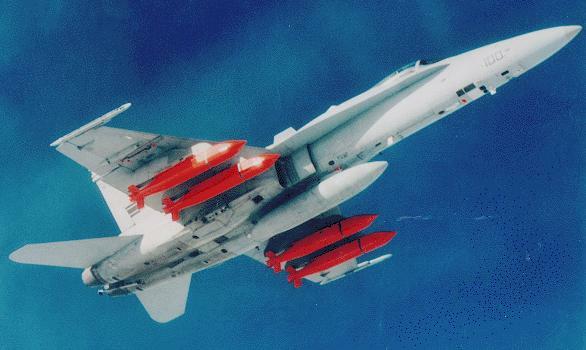 In December 1995, the Navy and Texas Instruments completed Development Test IIB (DT-IIB) at the Naval Air Weapon Center, (NAWC) China Lake and Point Mugu, California, with 10 for 11 successful flights of the AGM-154A BLU-97 dispenser variant. On January 6, 1997, it was announced that Texas Instruments Defense Systems & Electronics was being purchased by Raytheon Company, Lexington, Massachusetts. The U.S. Navy began Operational Evaluation (OPEVAL) testing in February 1997, after successful development testing and initial operational testing programs. The test program resulted in a 42 for 44 success rate or greater than 96% successful JSOW launches. The Air Force began Development Test & Evaluation (DT&E) flight testing of JSOW on the F-16 at Eglin Air Force Base, Florida, in March 1996. 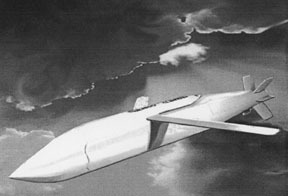 Air Force testing of the baseline JSOW was hindered by less than desired progress in the area of F-16/JSOW integration. There was never a problem in the interface between the weapon and the aircraft. The weapon worked perfectly. The problem that prolonged the testing at Eglin, was with a subassembly of the JSOW, which was not manufactured by Texas Instruments. AGM-154A (Baseline variant) system entered Low Rate Initial Production (LRIP) on schedule. 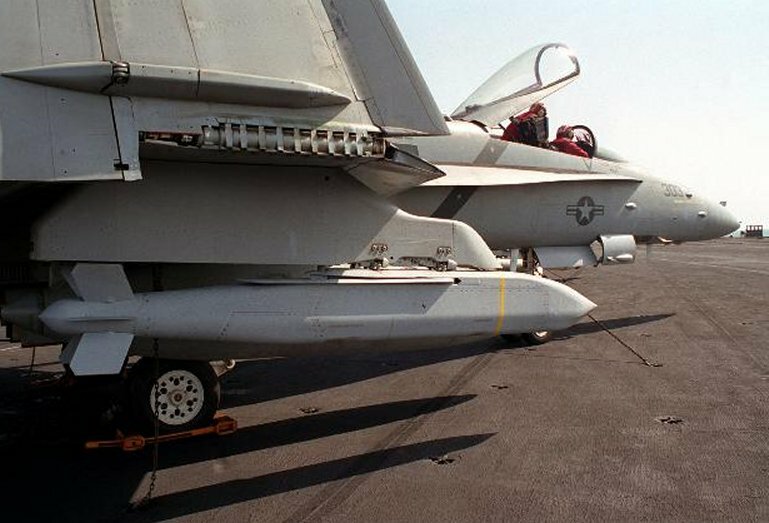 The $65.9 million LRIP contract was awarded by the Naval Air Systems Command (NAVAIR), in Arlington, Virginia, for 111 JSOW AGM-154A/baseline systems. LRIP for the other two variants are scheduled for FY99 and FY00, respectively. On 29 December 1998 Raytheon Systems was awarded a $133,881,355 firm-fixed-price contract to provide funding for the Full Rate Production Lot 1 of JSOW AGM-154A and the Low Rate Initial Production Lot I of the JSOW AGM-154B (AGM-154A: Navy - 328 and Air Force - 75) (AGM-154B: Navy - 3 and Air Force - 21). Work is expected to be completed by March 2001. 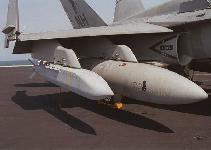 JSOW test articles were deployed in 1997 aboard the USS Nimitz and are currently deployed on the USS Eisenhower. 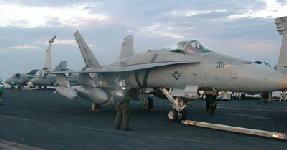 JSOW initial introduction to the operational commands was on the Navy/Marine Corps F/A-18 in mid-1998. 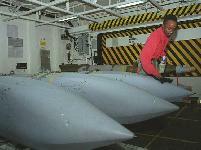 As of late 1997 a number of remaining JSOW test assets were on an interim deployment for further operational evaluation. 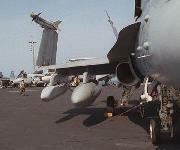 USS Carl Vinson 's air wing first employed the JSOW during combat over southern Iraq on Jan. 25, 1999. On 29 December 1999 Raytheon Systems Company, Tucson, Ariz., was awarded a $109,573,867 modification to previously awarded contract N00019-99-C-1014 to exercise an option for the full rate production Lot 2 of the Joint Standoff Weapon AGM-154A for the U.S. Navy (414) and U.S. Air Force (74). Work will be performed in Tucson, Ariz., and was expected to be completed by March 2002. 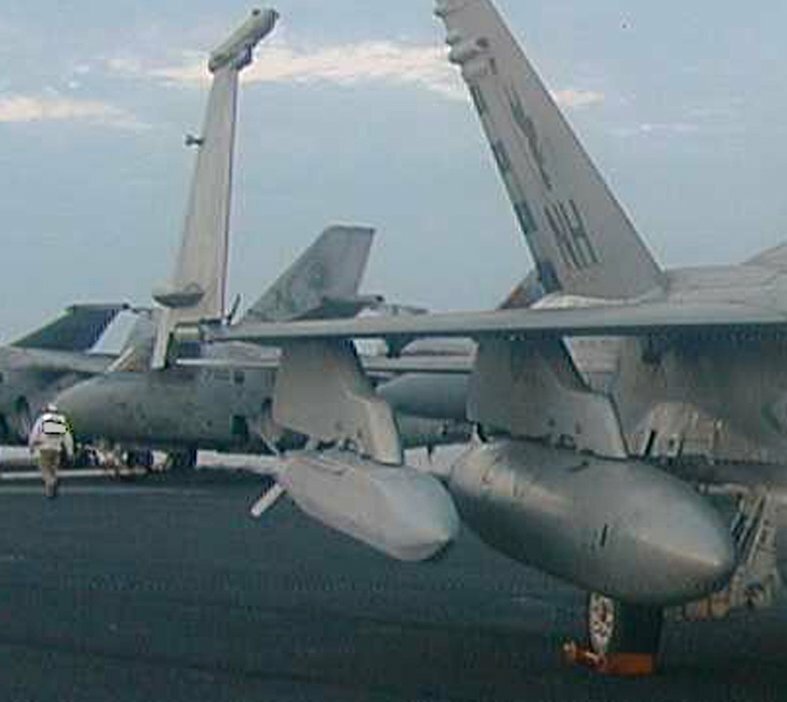 On 23 June 2000 Raytheon was awarded a $5,069,914 modification to previously awarded cost plus incentive fee basic ordering agreement N00019-98-G-0104 for the integration of the Selective Availability Anti-Spoofing Module (SAASM) into the Joint Standoff Weapon (JSOW) System. This effort will bring new production JSOWs delivered after 1 April 2003 in compliance with current Global Positioning System (GPS) security requirements for weapon-based GPS. Work will be performed in Tucson, Ariz., and is expected to be completed by May 2001. Weapon planning will be accomplished using the Navy's Tactical Automated Mission Planning System (TAMPS) and the Air Force Mission Support System (AFMSS). Aircraft-to-weapon communications will be via the MIL-STD-1760 interface, making inflight programming/targeting possible, as well as preflight data loading. 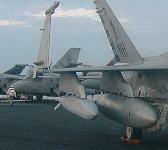 The weapon will be deployed from both carrier- and land-based aircraft, employing insensitive munitions technology. The JSOW will be employed on the following aircraft: F/A-18A/B, C/D, and E/F; AV-8B; F-14A/B and /D; F-16C/D; F-15E; F-117; B-1B; and B-52. 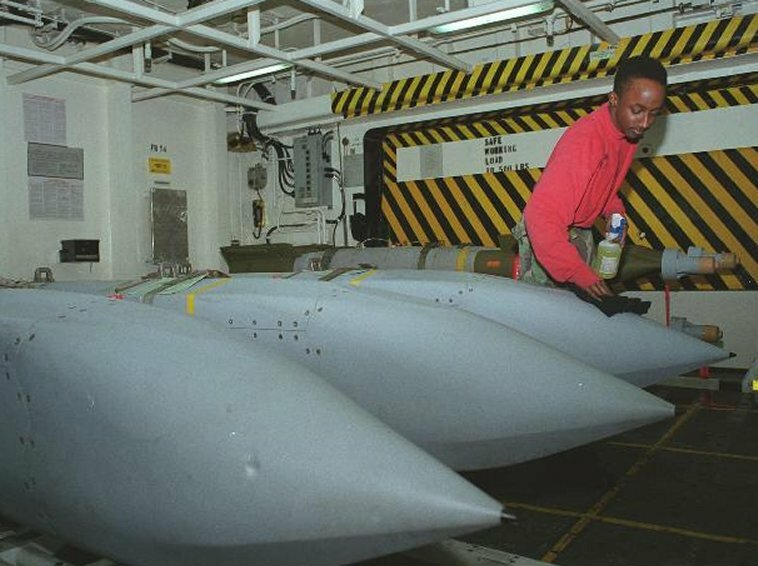 JSOW to come with 20-year bumper-to-bumper warranty Tester March 26, 1998 -- PMA-201 Conventional Strike Weapons Program Office has obtained a "20-year, bumper-to-bumper warranty" for the Joint Standoff Weapon (JSOW) when it goes into production later this year. Navy tests foreign warhead Tester June 11, 1998 -- The Conventional Strike Weapons Program Office, PMA-201, has completed testing of the Bomb Royal Ordnance Augmenting Charge (BROACH) warhead manufactured by British Aerospace, Royal Ordnance Division to determine their application to the JSOW Unitary. 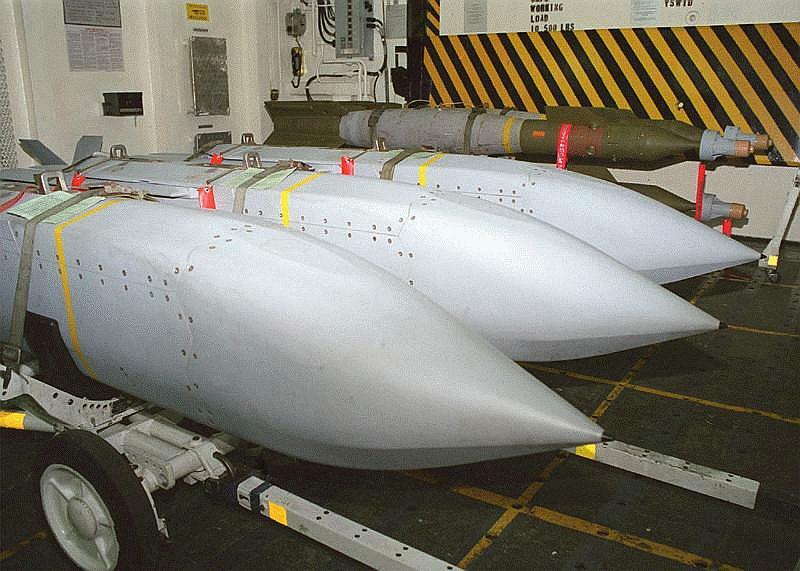 Navy Completes Tests Of Foreign Warhead June 15, 1998 --- The Conventional Strike Weapons Program Office PMA-201 has completed testing of the Bomb Royal Ordnance Augmenting Charge (BROACH) warhead manufactured by British Aerospace, Royal Ordnance Division. The tests demonstrated the blast, fragmentation and penetration capabilities of the warheads, and assessed their insensitive munitions performance to determine their application to the JSOW Unitary, Standoff Land Attack Missile. 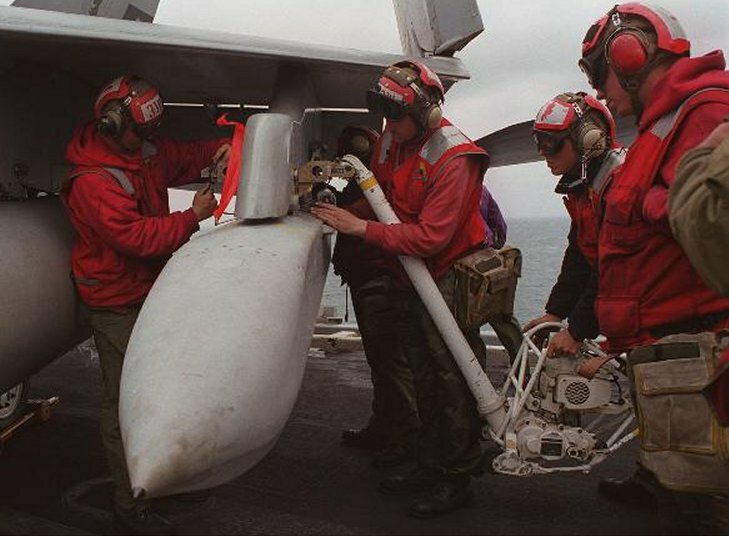 Navy Accepts First Joint Standoff Weapon - July 29, 1998 -- The first-production Joint Standoff Weapon (JSOW) rolled out at the right price, on time and exceeding expectations. The operator-friendly test models were deployed aboard the USS Nimitz last year and are now deployed on the USS Eisenhower. 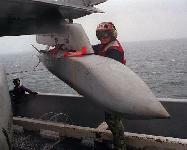 Navy accepts first Joint Standoff Weapon Tester July 23, 1998 -- The operator-friendly test models were deployed aboard the USS Nimitz last year and are now deployed on the USS Eisenhower. JSOW successful in first joint exercise The Rocketeer 3 September 1998 -- AGM-154A Joint Standoff Weapon (JSOW) made its first-ever appearance in joint training operations. 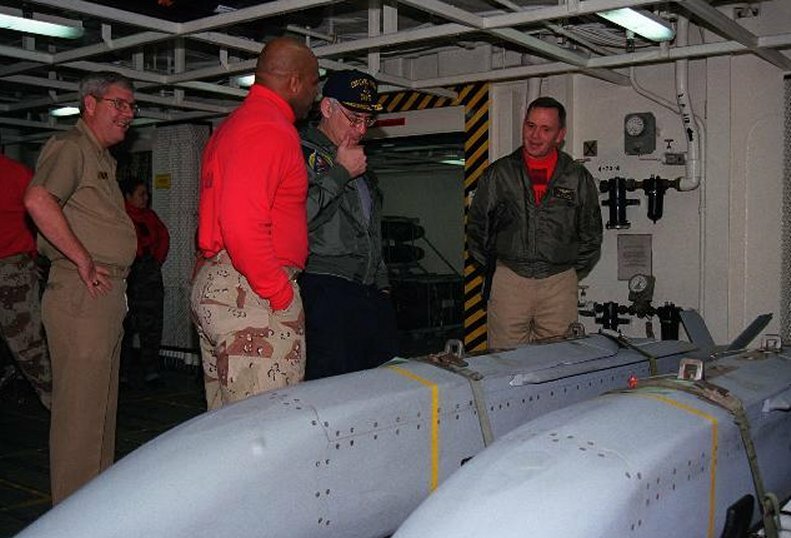 JSOW scores first combat success The Weaponeer 4 February 1999 -- Three successful Joint Stand-Off Weapon (JSOW) AGM-154A missions were conducted in the Persian Gulf area during the week of Jan. 24 by an on-station Carrier Air Group. 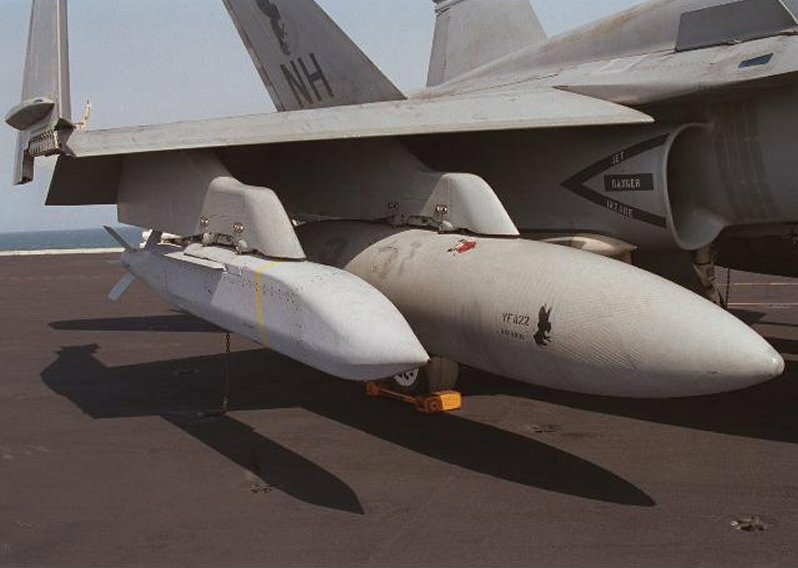 JSOW and JDAM Revolutionize Strike Warfare NAVAIR Public Affairs March 1999 -- When CVW-11 deployed in November 1998, the wing's F/A-18 Hornet squadrons (VFA-22 and VFA-94) did not have the mission computer hardware and software upgrades to allow them to use the recently produced JSOWs. To overcome this, a fully tested, but unreleased version, of the JSOW software was rapidly tested and proven to work. Naval Weapons Test Squadron provides direct support to combat operations The Weaponeer 1 April 1999 -- In response to an urgent fleet request from the USS Carl Vinson battle group in the Persian Gulf, LCdr. Mike Murphy, of NWTSCL, was tasked to assist in accelerating the deployment of baseline Joint Standoff Weapons (JSOW) to be used against Iraqi missile sites. WD Supports JSOW on Kittyhawk The Weaponeer on June 24, 1999 -- One shipment of weapons was coming from an ammunition depot in Oklahoma, and the other contained weapons being transferred from USS Carl Vinson. The delivery schedule for the JSOWs, however, was classified. JSOW honored with Daedalians' weapon System award The Weaponeer July 8, 1999 -- The award went to the U.S. Navy as the executive service for NAVAIR's Conventional Strike Weapons Program Office, PMA-201, Joint Standoff Weapon Integrated Product Team in recognition of outstanding management in the development, production, testing and early combat employment of the JSOW by the U.S. Navy and Raytheon. 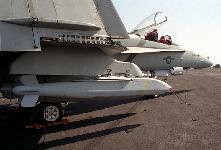 JSOW shows lethality in Navy shipboard operations Tester September 30, 1999 - The first successful launch of an AGM-154B Joint Standoff Weapon (JSOW) with the PBXW-11 insensitive explosive occurred at Eglin Air Force Base, Fla, on Sept. 16. Endurance flight test clears way for B-52 JSOW launch Tester November 11, 1999 -- The Joint Standoff Weapon (JSOW) Program reached another milestone Friday with the execution of the B-52 JSOW endurance flight test. This clears the way for the first-ever JSOW launch from the B-52, planned for mid-November. Live Joint Standoff Weapon (JSOW) Tested On B-2, TEAM Public Affairs, 08 March 2000 -- Members of the Whiteman B-2 Test Team recently tested and evaluated the latest B-2 software upgrade and the Joint Standoff Weapon (JSOW) in a series of missions over the Utah Test and Training Range. 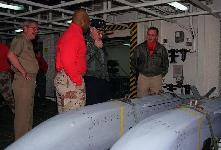 JSOW unitary continues Autonomous Targeting Acquisition Testing, NAVAIR Public Affairs Office, 13 February 2001 -- The U.S. Navy and Raytheon Joint Standoff Weapon (JSOW) Unitary team began the second phase of captive carry flight tests last month demonstrating the new Autonomous Targeting Acquisition (ATA). JSOW Alpha Contracting Case Study (Software Version) Dr. Mark E. Nissen, Naval Postgraduate School -- As a step toward simplification and streamlining, the Navy team at China Lake took the technical lead on the BLU-97 weapon system, the primary integration of which was planned for the Navy F/A-18. Likewise, the Air Force team at Eglin took the lead on the BLU-108 variant, the primary integration of which was planned for the F-16. The Navy team also took the technical lead on the Unitary variant.